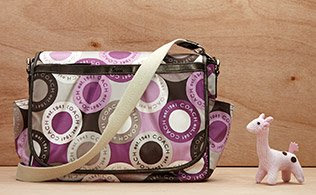 Who says diaper bags have to look like diaper bags? 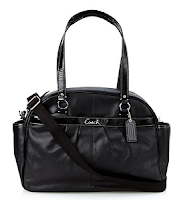 The assortment from Coach features cool silhouettes with all the essential details, like multiple interior pockets, coordinating zip pouches and changing mats. With these stylish totes and duffels, it's easy to look like the chic mommy you are. Soft leather with glossy patent trim, 4 outer and 7 inner pockets for organization, interior sleeve for storage of 23" x 12"changing pad, optional adjustable shoulder strap, handle drop of 9"
♥ Dimensions: height 11.5", width 16", depth 5.5", shoulder drop 17"